In 1957, Clarence Kirk, Sr. established a legal practice dedicated to powerful client representation through wisdom, commitment and integrity. Today, on this foundation, stands the Law Firm of Kirk, Kirk, Howell, Cutler & Thomas – an enduring legal team built to rise above expectations and protect the rights of its clients. Kirk, Kirk, Howell, Cutler & Thomas have amassed decades of statewide courtroom experience and success in both State and Federal Courts. This depth empowers clients to consider many possible case outcomes and strategies before choosing the path that is most desirable. When litigation will serve a client’s best interest, the firm has both the confidence to try cases and the skill to win. If legal action seems less practical, the firm’s history of compelling trial experience often serves as the catalyst that is needed to achieve the best negotiation position and the strongest possible client outcome. 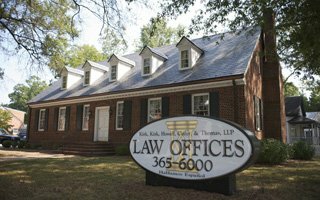 Every partner of Kirk, Kirk, Howell, Cutler & Thomas must be an exceptional lawyer and a proud member of the North Carolina community. Clients can feel both confident and at ease when working with members of the firm. Attorneys are accessible, candid, and results oriented assuming a hands-on approach with every client and case. Clients can expect high-quality consultation that includes upfront answers to questions and practical strategic options. What’s more, Kirk, Kirk, Howell, Cutler & Thomas adheres to the strictest ethical standards so clients are assured absolute confidentiality as well as economic efficiency as the firm operates like watchful stewards of each client’s time and money.